This year, it seems like all the end-of-year roundup stories are particularly negative. It turns out that rock stars are not immortal, and most of the people in my internet circles were not thrilled with the outcome of the presidential election. But at the end of each year there's always a small fringe counter-movement of articles explaining that the world is actually getting better, and 2016 is no exception. If you're among those who think 2016 in America was bleak (and I certainly am disappointed by a lot of events as well), remember that the rest of the world still marches forward. Here are some of these positive summaries from this year. This article from Our World in Data has been making the rounds quite a bit. It uses several charts that are near-identical to the ones from my book. Updated to 2015, it's nice to see that these trends from my book are all continuing as predicted. The article provides a convenient infographic that's easy to share. It's clever to cage it in a frame of "if the world was 100 people", which makes it easier to understand the scope of the progress. Here's also an interview with Steven Pinker, who can always be counted on to spread the optimist message. Although he clarifies, as I do in my book as well, that it's not really "optimist" as much as "realist", big-picture instead of in-the-moment, statistical instead of anecdotal. I also stumbled upon this great answer by Jeremy Fridy on Quora to the snarky question, "Liberals, why don't you want America to be great again?" He points out several facts about the state of the US today: that violent crime is at a 50-year low, abortion is at a 40-year low, the economy has grown and budget deficit shrunk in the past 7 years, and that Obama is leaving office with a higher approval rating than even Reagan. Finally, here's a monster of a rebuttal to 2016-pessimism, 99 Reasons 2016 was a Good Year, on Medium. There are endless (well, 100) successes in conservation, global health, economics, fighting climate change, decreasing violence, generosity, and more. Did you hear that global carbon emissions from the burning of fossil fuels did not grow at all in 2016? It’s the third year in a row emissions have flatlined. Probably not. Fingers crossed for a 2017 that reports more diligently on the trends that matter most. A few months ago I reported on new glasses that let color-blind folks see in full color. Now, there are two more inventions just this month that have the potential to help many people. The first is a "stem-cell gun" (I didn't make that up) that uses your own cells to create new skin on your body. This could drastically change the way we treat the victims of serious burns. Because brand new skin is growing, there aren't even any scars. You can learn more here. The other invention is a pen that counterbalances the shaking effects of Parkinson's disease, allowing patients to write again. You can watch the example of a graphic designer who had lost the ability to draw or even write her own name. Learn more here. From The Week: "Decades of research have shown that people tend to pair off with partners who are similar to them in terms of race, education, or religion, which often reinforces divisions between social groups. But a recent study suggests that the rise of online dating is breaking down some of those barriers. "Americans in the survey who met through friends or school were the most likely to date someone similar to them. Meeting online, however, was 'associated with more racial and ethnic mixing than any other venue.'" Thank you, online dating! In this time when the media relentlessly focuses on the divisions between Americans - whether racial, economic, or political - it's good to see that under the surface some forces are secretly pushing back. And the result should be significant - it's estimated that up to one-third of all marriages today are of people who met online. And, to top it off, these people tend to be slightly happier in their marriages. Incomes rise and poverty drops in the U.S. I usually try not to put too much into short-term economic data, preferring long-term trends. But this news seems significant considering we are only a few years out from what was very nearly a second Depression. The economy's slow improvement is finally showing clear dividends. The Census Bureau recently reported that 2015 was the first year since 2008 that the poverty rate fell significantly and incomes rose for most American households. According to this article, the "median household’s income in 2015 was $56,500, up 5.2 percent from the previous year — the largest single-year increase since record-keeping began in 1967." Last year, 3.5 million Americans were able to lift themselves over the poverty line. That's a 1.2 percentage point decline in the poverty rate, the largest drop since 1999. That drops the poverty rate down to 13.5% of the population. You can read more here. This ends the last war in the Western Hemisphere. Half the world is now free of war. This does not mean there is not still violence, and crime, and strife, of course, but this is a milestone occurring for the first time in modern history ... and perhaps all of human history. We should also consider that the Eastern Hemisphere is not completely war-torn, despite our daily headlines. Europe remains free of war. East Asia, Southeast Asia, Australia, Oceania - all war-free. In fact, all of the outright war in the world is localized in one large strip stretching from central Africa through the Middle East to Pakistan. Objectively, this is still a lot of war ... unless you compare it to any other point in human history. As the ever-reliable Steven Pinker writes, "Today, there are no military governments in the Americas. No countries are fighting one another. And no governments are battling major insurgencies. ... This progress of an entire hemisphere toward peace follows the path of other major regions of the world." This war lasted 52 years. This is older than 75% of our population. If a war like this, and a conflict like the one in Northern Ireland for example, can reach peace, then surely any conflict can. These are fights that people called intractable, for decades. Surely this must give renewed hope to other seemingly unsolvable conflicts, like India/Pakistan, Shia/Sunni, and particularly Israel/Palestine. What's next? After we stop all wars in the world, can we move on to smaller forms of violence? Ending all terrorism? All gang war? All murder? All crime? ... Or, we can work on all those things at once, since all those trends are declining as well. There is no war visible in this photo. Oh, you know what else is fixed now? Color blindness. I was a little skeptical, but it all seems to check out. You can read this Forbes article in which the author tested the glasses. The author leaves with the conclusion that these are a luxury item; expanding the browns he's always seen to more vibrant reds is not life-changing enough to justify the high cost of the glasses. While that's probably a good assessment today, now that we've invented the technology, it's only a matter of time before the cost comes down. Not only that, but we could see this technology embedded in contact lenses or even expanded in other ways. Centuries ago, regular corrective glasses seemed like a luxury item; indeed, they still are in many parts of the world, but that area is shrinking. And contact lenses were much more indulgent when I was young, now they're more commonplace. I'm eager to see this technology spread in the coming years. One of the underlying premises of my book The Secret Peace, one of the reasons why I felt it was needed, was that it's way too easy for all of us to rely on anecdotes and personal evidence when deciding to be optimists or pessimists. I wanted something that tallied tons of data, that looked beyond individual stories to see trends that our human brains are unfortunately designed to miss. HOWEVER ... sometimes, you just need a good pick-me-up. This story here doesn't prove any larger trend about the world, other than that people are amazing. And sure, I guess that's the most important thing. Read this article about New Yorker Ida Keeling, and the hardships she has overcome, and how she found her passion for running again late in her life. And when we say late, we mean it. Ida is 100 years old. Effective altruism is the practice of donating money based on where it will do the most good in the world. Research shows that currently only a small amount of the world's charity is donated this way. Most people donate money based on emotional appeal (look at this photo of a sick child) or personal connection (their alma mater, a friend's fundraiser), and limited to their own locale or country. The concept of effective altruism appeals to me a lot because it is like a turbo boost to the Secret Peace. The main thesis of my book is that the world slowly and inexorably gets better just due to people going about their lives, since most people contribute to civilization in some small way. If people were to actively try to make the world a better place - and of course many people do this - it would speed along this process. And if those people were able to focus their energy in the most effective way, on the world's most dire but solvable problems, well, then you get that turbo boost. So, the more people that buy into effective altruism, the better. And it doesn't take a lot. It just means that whatever amount of money you normally donate to charity, try to donate it to the best places. There are organizations that rank charities (such as GiveWell) and can recommend the best ones. (Singer makes the good point that the frequent criteria "What % of your money is wasted on overhead?" is not as important as "Is our work actually effective?") And, if you don't already donate a good chunk of your income to charity, try to donate a little more. Because I can tell you, if you're reading this, there is definitely someone out there who needs it more than you. Unfortunately, if the goal is to get more people to do this, I don't know that Singer's book is the one to do it. It's just not inspiring. It has a little more of a lecturing tone, sadly. My main concern with this book is not its noble intention, but that Singer's philosophical habit of arguing via anecdotes and hypothetical examples is contrary to the ethical altruists' aims of focusing on hard data. Singer's focus on elevating animals to human status is also distracting in the book. I get that this is his famous thing, but it's just a separate issue. It's trying to do two things at once. I agree with his focus on empathy and a lot of his writing in this regard, such as the expanding circle, but here it's overreach. I was hoping for more of a focus on comparing the different topics we could be spending resources on and ranking them. Instead, we get similar arguments for the main idea, repeated. The book is not structured well. And while I agree with 90% of Singer's utilitarian leanings, I disagree that the logical end of the super effective altruist is taking a job you loathe or job that hurts others, just to make enough money to help more others. The ends can not justify the means. We have to approach the problem from both sides, and every part of our lives should be consistently ethical. How many languages will you soon be able to speak? In an article on the great IFL Science, David Arbesu talks about an area in which technology is quickly advancing: translation. He basically rebuts the Wall Street Journal's Alec Ross, who argues that within a decade, we'll be able to talk to someone in a different language using small earpieces and microphones - and presumably an app on our phones. (I mentioned the leaps of progress we've made towards this direction in my book, too.) But Arbesu argues that this will never come to pass, for no matter how good computer translation might get, it will never quite pick up the ineffable nuance of human speech. It's true that live translation is a tough problem that has vexed many and won't be easily overcome. But I have faith. Sure, computers will need to get semantically smarter, but they're headed in this direction. Have you tried Word Lens? It's an app that has been out for at least five years now, which translates written text live as you point your phone camera at things. It's particularly useful for reading signs when in another country (probably not while driving). It's clunky, but it works, and is there any way to imagine a world in which this technology does not improve? I always regretted not becoming fluent in a second language. I wasn't able to muster the will to get far past rudimentary French and Spanish lessons. Of course, there are many benefits to learning other languages, but the petty part of me is looking forward to saying "See? I didn't need to do this! I told you so" on this one. I'm really looking forward to where this technology is going to go. I saw a video clip someone Facebooked recently showing how bad Beijing's smog is. It was a hyperbolic news segment that noted that "this is what an average day looks like here" while also mentioning at the end that they filmed on the record worst day of the year. China has a real pollution problem, and it's terrible, but it doesn't worry me. That's a soluble problem. It's one we've solved before. As an Occupy Democrats post put it, "Woah! Think Beijing is smog-choked? Well NYC used to be just as bad. Many Americans have forgotten just how smoggy many of our cities were until Nixon signed the Clean Air Act in 1970. It took some time to really get off the ground, but its positive effects today are crystal clear." Here are some more photos of smoggy 1970s America. Of course, this argument only holds water if there are no long-term negative externalities to this much pollution. As we know now, there are, of course: 1) the pain and death directly caused by air pollution and 2) climate change. The first point is terrible but needs to be compared to the pain and death caused by poverty. I haven't done that math, but again, economists would say that millions of people are choosing the former over the latter. They would rather have pollution than poverty. The alternative to pollution in China is not just beautiful blue skies and scenic rural landscapes. It's the poverty that comes with those, until the country is able to eventually afford to adjust its development in a cleaner direction. The second point, climate change, we're finally starting to see some action on. That's why it was reassuring to see the landmark Paris deal two months ago. It's not the final step, but it's still a step in the right direction. One survey found that two-thirds of Americans believed that the proportion of the world population living in extreme poverty has almost doubled over the last 20 years. Another 29 percent believed that the proportion had remained roughly the same. That’s 95 percent of Americans — who are utterly wrong. In fact, the proportion of the world’s population living in extreme poverty hasn’t doubled or remained the same. It has fallen by more than half, from 35 percent in 1993 to 14 percent in 2011 (the most recent year for which figures are available from the World Bank). A big driver of this change has been the UN Millennium Development Goals, which helped focus aid efforts and countries' priorities to focus on what matters most. Each country had specific targets in eight different topic areas. This creates hundreds of individual goals, and not all of them were met. But, against seemingly-impossible odds, the majority were. The world has agreed on a new set of goals, the Global Goals. These 17 goals are even more ambitious - but achievable. It's a good idea for us all to familiarize ourselves with them, to be aware of the progress most of the world is focusing on. Two recent incredible developments in Southeast Asia. First, ten countries recently signed a pact to form a European-Union-style organization. The countries - Brunei, Cambodia, Indonesia, Laos, Malaysia, Myanmar, the Philippines, Singapore, Thailand, and Vietnam - have a population of over 600 million, which is more than the EU itself. Obviously there are always pros and cons to such an arrangement, but history shows that closer economic ties between countries lead to more development and less conflict overall. The official results are still being tabulated, but all signs so far point to that rarest of things: an authoritarian government peacefully giving up power after what outside election monitors have deemed a credible vote. Analysts and Myanmar’s citizens are still coming to grips with the results. But the outcome appears to stem from the simple fact that veneration for Ms. Aung San Suu Kyi was underestimated and the ruling party’s strength overestimated. In the days before the elections, the ruling party organized large convoys of tractors to ride through the countryside. Thousands of farmers, wearing T-shirts given out by the party, chanted slogans and waved party flags. Wedding bands performed patriotic songs. But that show of support was misleading. Many of the farmers said they had taken part in the rallies because they were paid, but when it came time to stamp their ballots, they voted for the National League for Democracy. The world is better than you think. Not only is world peace inevitable, but for a lot of the world, it's already here. This blog, a companion to my book, will point out positive trends that are often buried beneath bad news. It'll also advocate solutions to the problems that admittedly remain. World peace is on its way, so let's work to speed up its arrival! 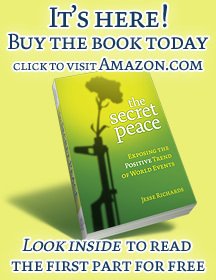 I’m the author of The Secret Peace: Exposing the Positive Trend of World Events (Book & Ladder Press, 2010.) I'm driven by such diverse passions as critical thinking, nonviolence, history, and technology trends, all of which I've presented talks on. My site, jesserichards.com, is now proudly over 18 years old. I'm currently the Director of UX at Grovo. I've also worked for several technology companies and marketing agencies as a Director of Product, Art Director, and UI designer. I am a member of Mensa, and in my spare time I organize the Central Park Sketch Meetup, the world's largest art Meetup. Proust - Know the ones you love.